iEvac EBP-900 Smoke Escape Hod is the only Fire Escape Hood certified to the American Standard ASTM E2952-14. In addition, the U.S. Department of Homeland Security has designated the iEvac® as a Qualified Anti-Terrorism Technology. The Fire Hood contains a HEPA P100 filter that removes sub-micron particles such as ebola, anthrax, ricin, smallpox, and radioactive particles. The iEvac smoke mask protects against fire-related gases including carbon monoxide, hydrogen cyanide, smoke, & hydrogen sulfide. The Emergency smoke hood also protects against sarin, smoke, hydrogen cyanide, chlorine, ammonia, sulfur dioxide, tear gas, OC, and more. 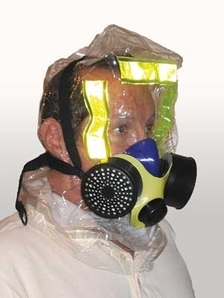 The EBP-900 fire evacuation hood contains a HEPA filter that removes more than 99.97% of sub-micron particles such as ebola, anthrax, smallpox, and radioactive particles. The universal sized escape respirator can be put on in under 30 seconds. The emergency escape respirator als features easy-to-breathe dual filters and is compact, lightweight, and vacuum sealed in a foil bag for a long shelf life. Its unobstructed field of view can be used with eyeglasses, beards, and long hair. Email sales@westernsafetystore.com or call (206) 438-9925 for discounted pricing. Price listed is MAP price.